Antec's One Hundred is the gaming case that delivers high-end features at a price that won't break the bank. Eight expansion slots provide exceptional expandability, and can accommodate multiple video cards. A sleek painted black interior with clean, perforated front bezel houses your components in style, while the four top USB ports with audio in/out and handy storage tray bring convenience and accessibility to the package. Finally, the bottom PSU mount, two included TwoCool™ fans and washable fan filter keep your system cool and quiet. 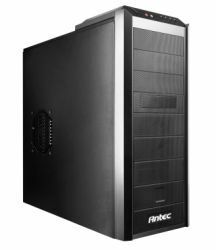 Antec's One Hundred provides a wealth of in-demand features while keeping you within your budget.